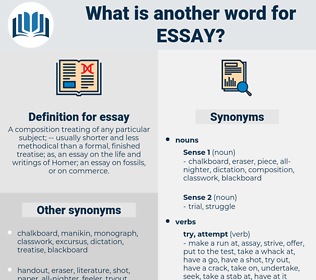 What is another word for essay? thesis, paper, drafting, rehearsal, discourse, presentation, writing, statement. fun, peace, pastime, laziness, entertainment. drop, overlook, pass by, abandon, throw over, omit, throw away, give up, let go, throw up, dismiss. idle, rest, neglect, be idle, forget, laze, relax. I learned afterward that although his nose was red, his essay was not. I have burnt my essay for the Academy. each, esox, eggshake, ecosoc, eisegesis, exegesis, ecesis, excess, egg, eec, eq, echoic, echo, excise, eschew, ego, eccyesis, ex, esq, Equus Quagga, ese, eyck, eyes, ec, ezekias, es, eos, each week, exiguous, esaki, eggwhisk, ease, ecg, eeg, essex, eyas, ekg, EXEC, easy, equus, eyeish, e.g., esau, ecc, eggs, ezo, excuse, egis, EAS, ECK, eyewash. disquisition, theme, paper, Thanatopsis, composition, memoir, report. effort, try, endeavour, endeavor, attempt.